This view of the West Front of Hampton Court Palace shows the magnificent Tudor architecture. The main approach to the Palace was through Cardinal Wolsey's Great Gatehouse with its heraldic beats on pillars and large oriel window. The 400 ft long, symmetrical facade which was originally two stories higher than at present, and was considered to be the most magnificent of its time. 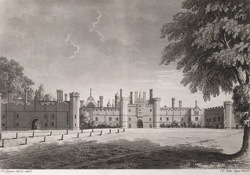 The Surveyor of buildings was Lawrence Stubbs although it is thought that Wolsey himself designed much of the Palace. The Palace was unusual for the 16th century because it was built in red brick rather than plain stone and was designed not as a fortified castle but as a Palace with every modern comfort.